Just a quickie outfit post. 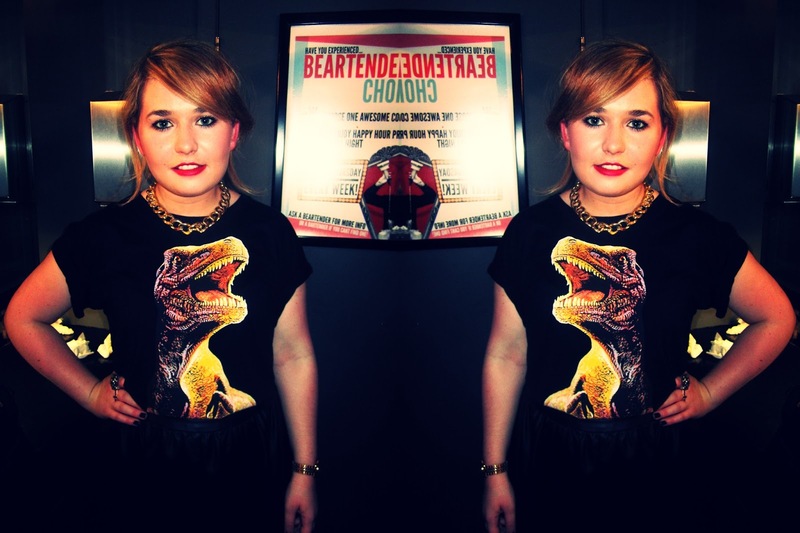 I threw this cool Dinosaur tee on with my leather skirt Friday night for hitting the town. We headed out with no real plan and ended up in Covent Garden. Quite literally stumbled across a cool bar called Adventure Club. The cocktails were pretty good to say the least! And the drink menus were video tapes with random names like 'Star Whores'. This tshirt was a Topshop sale bargain I picked up last weekend. I just couldn't resist. I mean, who doesn't love a Dinosaur tshirt!? Your blog is a delight and I have found myself travelling back in time through your posts......and who doesn't love a dinosaur tee!!! !